Yet at the same time we can be uncomfortable with silence. As a nation, our cultural conditioning urges us to fill the gaps in conversations. As individuals, we may quickly become uneasy if a family member or friend is uncommunicative. We may leap to unwarranted conclusions should our partner or lover remain silent for a time. Could silence in art provide an insight into this ambivalence? 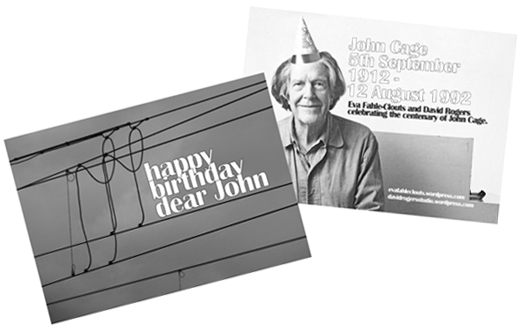 Perhaps most obviously, into the context of silence, comes John Cage with 4’33’’ (1952) – undoubtedly one the most controversial works of the 20th Century. While it is suggested that Cage’s intention was not silence, but rather that the piece would comprise the ambient sounds generated by the (non-playing) orchestra, its audience and the venue itself, this also predisposes to meditation. Was Cage courting controversy? Was he really looking for silence/near silence? Perhaps. But neither of these points preclude his having various other outcomes in mind – issues relating to composer/performer/ performance and audience; to speaker and listener; to the possibility of silence(near silence); to our discomfort with – even fear of – silence in certain situations; to the mind and stillness. The issue of authorial intent remains problematic. 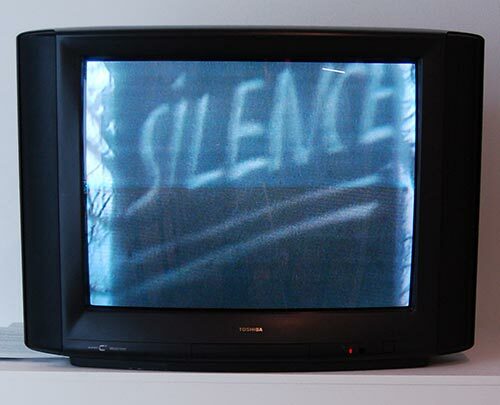 In contrast, the video installation by Nam June Paik – One Candle (1988) – is a work entirely predicated on reflection – both literal and figurative – via Buddhist themes of meditation. There is no soundtrack to this piece, just the candle and its reflections and refraction. A burning candle, however, makes miniscule sounds – is this true silence? Clearly, the lit candle also holds a range of meanings within numerous cultural and religious contexts. Most universal, are perhaps the manifest themes of life and death. 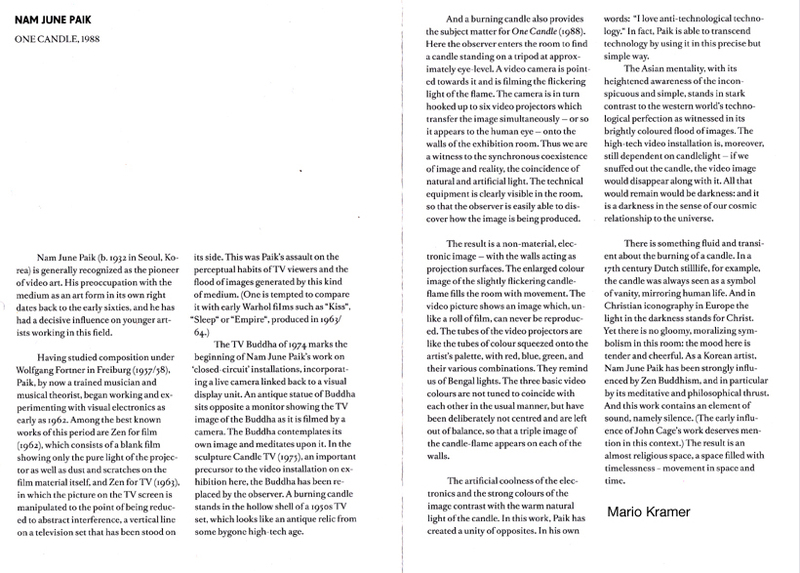 On a grander scale, critic Mario Kramer references the following: ‘if we snuffed out the candle (…) All that would remain would be darkness: and it is a darkness in the sense of our cosmic relationship to the universe.’1 A powerful echo and elaboration of this concept comes in the words of astronomer and author Carl Sagan in his public lecture ‘A Pale Blue Dot’(1994)2, responding to a fleeting image of the Earth in space, captured by Voyager 1 in 1990. Is this the silence that we are perhaps most afraid of – that of our own demise and of the fragile planet on which we live? Finally, though by no means least, there is the creative work of Bill Viola. Viola uses sound and silence, often employing elemental sounds of the visual fire and water on screen, to complement his compelling video works. Focussing on themes of birth, love, life and death, reflection – meditation on the human condition – is almost a foregone conclusion. Here, again, there is no complete silence, but a stillness that can, and does, transfer itself to his audiences. Silence, it would seem, is all but impossible – if only because the sounds of our own bodies are ever present – in stillness we become aware of heartbeat and breathing – as was no doubt the case, at the very least, with Cage’s 1952 audience. It seems that, in fact, we both desire and fear silence – in art as in life – in about equal measure. However, when modern life moves us to crave what we might call silence, art resonating with this desire takes on new meaning – reinforcing that Cage and Nam June Paik were truly artists ahead of their time, with Viola both ahead of, and in tune with, current Zeitgeist. So perhaps it is towards life and work exploring and incorporating aspects of the quiet – the overlooked, unnoticed or undiscovered sounds within our lived environment – that we may find art, beauty, calm and solace. A quiet voice might yet be heard through the babble of 21st Century life… Or should the next step be a form of ‘(s)elective mutism’ in art?